1) The Time Wars – what formed the reboot Doctor? 2) the start of the Doctor as we know him – as a young Gallifreyan, with Rassilon. What made him a renegade Timelord? Epic coolness there with both. 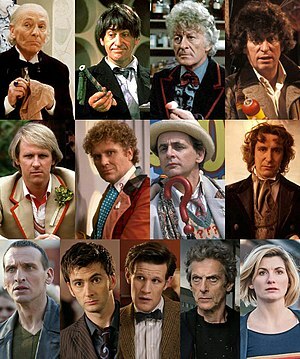 Basically, lets see what forms our doctor, hmm? In one of those lovely quirks of irony, I was showing my seven year old son the Doctor Who episode Dalek on Sunday. You might remember it. Written by Robert Shearman, it’s arguably the finest Dalek story since the show returned in 2005, and the bit that stuck in my head tonight was the moment when the solitary Dalek managed to absorb the entire Internet. It struck me that if he’d tried to do that, around twenty minutes after Variety uploaded its story regarding a film being made of Doctor Who, it might just have imploded there and then. via A few thoughts on the Doctor Who movie news – Den of Geek. This entry was posted in Films/TV, Meanderings and tagged BBC, Dalek, David Yates, Doctor, Doctor Who, Rassilon, Robert Shearman, Whoniverse on November 16, 2011 by Romana Challans. You know i said before i probably would always be reduced to tears about Sarah Jane…well, watch the final bit of the last of her series. No wonder i am weeping. We already said goodbye to Elisabeth Sladen, one of Doctor Who’s greatest stars, back in April. But with today’s final episode of the Sarah Jane Adventures, we’re having to say goodbye to Sarah Jane Smith, the character she played since 1973.
via A Final Goodbye to Sarah Jane Smith, Doctor Who’s Best Friend. This entry was posted in Films/TV and tagged Doctor Who on October 19, 2011 by Romana Challans. Some say Farewell, Sarah Jane Smith – I say Thanks. It’s the final episode of The Sarah Jane Adventures today. via Farewell, Sarah Jane Smith – Den of Geek. Not in my heart. In timelines, Sarah Jane roams still. And of course, as they list, the Blackadder series wraps up with the shocking end to the hilarity – so poignant, bitter, and appropriate. Someone in the comments also counts Season 4 as the best place to end Babylon 5 on – and oh, how I agree! via Six to watch: perfect end-of-show finales | Television & radio | guardian.co.uk. * did i mention i have met Sylvester, Colin Baker, and the lovely Katy Manning – splendid chaps, all of them! Colin called me a Titian beauty, and claimed that, as my name is Romana, and Tom Baker briefly was married to Lalla Ward, Romana no 2, i am married to him and Sylvester, who laughed and agreed. Oh, swoon…. This entry was posted in Films/TV and tagged Babylon 5, Blackadder, Colin Baker, Doctor Who, DoctorWho, Finales, Katy Manning, Sylvester McCoy, Television, Television program on October 7, 2011 by Romana Challans. There are some actors who affect you profoundly with their character. For many other people besides myself, Nicholas Courtney provided one of those characters. Like the radiantly special Elisabeth Sladen, his Doctor Who character, The Brigadier, Brigadier Alistair Lethbridge-Stewart, provided a sparkling human counterpoint to the Doctor. Strong but flexible, this actor played the character as if he was the man. He has been deeply mourned by the community. I cried when he died, as did many others. He was one of the few ‘human’s in the series who you felt could make things ok. I am glad they are honouring that. He has battled an insane half-human, half-flesh mutant called Jennifer, crash-landed in Nazi Germany and met up with his old foes the Cybermen in the series so far.But on Saturday night the Doctor will take time off from saving the Earth – and himself – to pay tribute to one of the shows most popular actors, Nicholas Courtney, who died this year after playing the Doctors companion, Brigadier Alistair Lethbridge-Stewart, over a period of more than 40 years. via Doctor Who tribute to Brigadier actor Nicholas Courtney | The Guardian. This entry was posted in Films/TV and tagged Doctor Who, Television, tv on October 1, 2011 by Romana Challans. Elizabeth Sladen – THE Doctor Who companion of my generation, has died far too young, too vibrant, still being our companion in The Sarah Jane Adventures. This entry was posted in Creativity, Events, Films/TV and tagged Doctor Who, Elisabeth Sladen, Sarah Jane Adventures, Sarah Jane Smith, Tom Baker on April 20, 2011 by Romana Challans. Colour me wildly not panicked! “Andrew Orton’s “Doctor Who: The Hitchhiker’s Guide to the Daleks (The Peter Jones-y Edit)” mashes up the BBC Hitchhiker’s Guide to the Galaxy classic TV series with a Tom “the best Doctor Who” Baker encounter with the Daleks. This entry was posted in Films/TV, Funny and tagged BBC Hitchhiker, BBC Television, Doctor Who, Douglas Adams, Peter Jones, Television program, The Hitchhiker's Guide to the Galaxy, The Hitchhiker's Guide to the Galaxy: The Primary Phase (BBC Radio Collection) on June 23, 2010 by Romana Challans. “I don&apos;t know what it&apos;s like to be God – obviously,” Gaiman told the BBC. via BBC News – Neil Gaiman reveals power of writing Doctor Who. This entry was posted in Books, Creativity, Films/TV and tagged BBC, Doctor Who, Neil Gaiman, TARDIS, Writing on May 25, 2010 by Romana Challans.